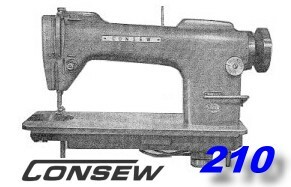 CONSEW 210 & 210B. Self oiling single needle lockstitch. Large quantities were imported into Europe in the Late 70's and 80's. Need A Part For Your CONSEW 210 Machine ? We can supply you with all disposable parts for the CONSEW 210 machine from stock. TRY US.